Also, plan to hear her live interview as she reviews the main issues and FFL’s proposed solutions this Wednesday at 1:25 p.m. Eastern time on SiriusXM’s The Catholic Channel, Channel 129, where she will be interviewed for half an hour. 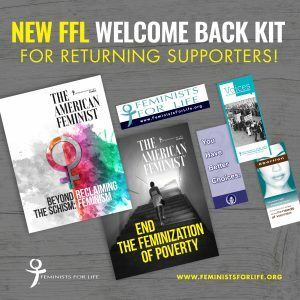 New and returning members will receive a copy of “End the Feminization of Poverty,” along with a subscription to The American Feminist. Please contact me if you wish to inquire about an FFL speaker for a campus event, benefit, conference, or rally. If you are a member of the press and wish to interview Serrin during March for Women’s History Month or Joyce McCauley-Benner during April for Sexual Assault Awareness month — or if you would like them to submit an opinion editorial — please email me at your earliest convenience. Also, we are starting to get inquiries about our exciting telecommuting intern positions. You can get a good idea of what you might be doing here as you listen to Kara Sorenson (FFL’s newest Board member!) talk about her experience during the March for Life Youth Rally. 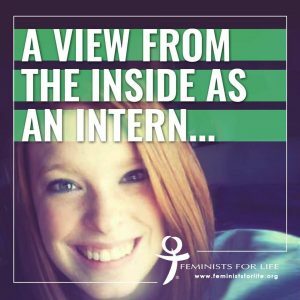 Contact me if you are interested in an internship or volunteer position with Feminists for Life of America. Please include a cover letter explaining why you are pro-life and a feminist (or not) and what skills you could offer, your résumé, and a writing sample.